Already entrenched in the corporate world, it’s no secret that Canadian handset maker RIM harbors serious consumer ambitions, an area it sees as most likely to produce future growth. Case in point is the company’s recently released ‘BlackBerry Storm’, an all touch screen affair that arguably puts video playback and other consumer features ahead of ‘corporate’ email, which has long been RIM’s ‘bread and butter’. 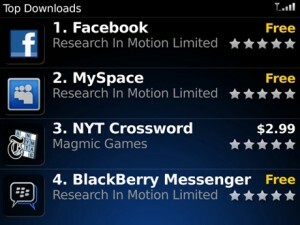 Today’s launch of ‘BlackBerry App World‘, the company’s answer to the iPhone’s App Store, provides even greater evidence of a consumer push, with apps for Facebook, MySpace and Instant Messaging, currently dominating the “featured apps” list. Even though I’ve not yet had a chance put to ‘BlackBerry App World’ through its paces – I don’t own a BB or have one on loan right now – going by the tech blogosphere and the screen shots I’ve seen, it looks like RIM have done a pretty decent job, although the use of PayPal to process payments hasn’t gone down well with everybody (RIM says they are working on providing alternative billing options). One thing worth noting, however, is that right now very few of the store’s offerings are in fact new. Instead, it’s the aggregation of existing RIM and third-party apps into a single store, and one that’s being promoted by the handset maker itself and will, presumably, come pre-installed on future BlackBerrys, which is a big deal. That together with the more generous revenue share that RIM is offering – a 80/20 split in favor of developers compared to 70/30 on the iPhone, which should see plenty of new third-party apps appear in the future.